The mirchi or peppers used in this recipe is thick, large one which is not very hot. These peppers are also known as 'Bhavnagri Mirch'. This mirchi is widely available. 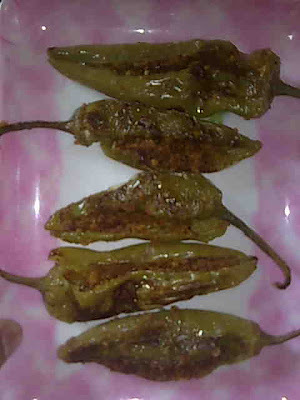 This recipe of bharwa mirchi is absolutely lip smacking and me and my husband's favorite. Since we remove fiber and seeds from the mirchi, their heat is considerably reduced and hence can be eaten by those of you who don’t like very hot food. 1. Make a vertical slit on one side of peppers. Remove all the seeds and fiber from inside. This reduces heat of mirchi. 2. Heat 2 tsp oil in a pan and add besan. Roast besan, stirring, till nice aroma comes out of it. Add all the spices and salt and roast for 1 more minute. Take out besan mixture from the pan. 3. Let the besan mixture cool down a little. Stuff this mixture into the peppers. 4. Heat 1 tbsp oil in the same pan and place stuffed peppers in it. Lower heat and cover the pan with a lid. 5. When the mirchi gives a roasted appearance from underneath that is look brownish, turn over and cook from other side also. Cook till roasted from both sides. Serve hot bharwa mirchi with parathas.